What is the difference between being a List Manager and an Admin? 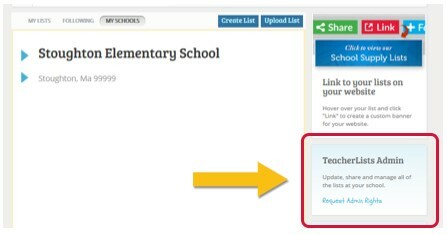 A List Manager is anyone who creates a list for their classroom or school. This could be a teacher, principal, school secretary, computer teacher/webmaster, district staff, PTO/PTA parent leader — anyone who posts or uploads a list, is a List Manager. An Admin is a List Manager who is approved by the school to manage all the lists for that school, even if they did not create them. This is typically the school administrative staff (school secretary, principal, webmaster/computer teacher, etc.) although a parent group can also handle this for a school. When looking at the lists in the dashboard, the Admin will have a “hammer” sign ( ) next to the lists that they have Administrative rights for. Although these lists were created by someone else, the Admin will be able to edit, share and/or archive these lists as if they were their own. Not sure if you are an Admin? Click on “Edit Account Info” (top right hand corner of page) and check the User Type in your Account Settings. The User Type will indicate whether you are a Parent (just viewing/pledging lists), a List Manager or an Admin. Click here to log in to your account and get started now!